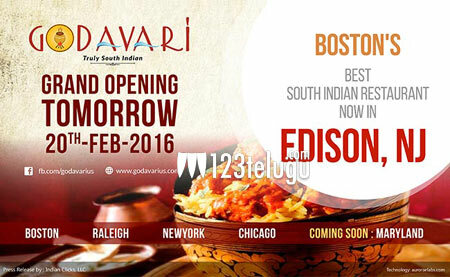 USA, February 19th 2016: USA Godavari, the fastest growing restaurant chain in the United States, offering South Indian cuisine, is all set to grow bigger with the opening up of new restaurant in Edison in New Jersey on February 20, 2016 with a Grand Lunch Buffet. This will soon be followed by opening of restaurants at Maryland, Denver, Delaware and Virginia. The group has already been alluring the food lovers in Woburn, Raleigh, NY and Chicago, and has now embarked on surpassing its own expectations on the popularity chart with authentic South Indian tastes. Designed as a 150-seater restaurant, the Edison restaurant also houses a banquet hall for various occasions and get-togethers. The uniqueness of the restaurant is the authentic recipes introduced to tickle the taste buds of those from New Jersey along with an elaborate lunch buffet ever to be offered in the city; that include dishes like “Kanchipuram Kundelu Mamsam”, “Veerappan Vada Chili”, “Mamma gari Mutton Mandi”, “Allagadda Aloo Fry”, “Jayamalini Junnu”, “RGV Raagi Sankati”, “KTR Shahi Tukda” and many more authentic and innovative recipes. Godavari is also saluting and honoring the heroes Lance Naik Hanumanthappa and Mustaq Ahmed who lost their lives at Siachen with naming few dishes after their names in all the locations on Feb 20, 2016. The chain is also introducing an innovative concept called “Red Carpet Lunch”, for the first time in the US. The photograph of every guest is taken before the lunch as they step in, and a photo gallery is shared with the guests the following day, with ‘Godavari’ banner and a red carpet. Sankeerth Photography Services is going to shoot the Video teaser and the high quality photos. The lunch is followed by a DJ night in the banquet hall by renowned DJ Monu with a nominal cover charge of $20 which includes the food and the music with a paid Cash bar. The restaurant has consistently offered the best tastes to the Indian Diaspora since its inception, making them feel at home with native cuisine and culture. Godavari restaurants chain has also been engaging its guests on various festivals and other occasions. The Sankranthi revelry was a runaway hit while the Valentine’s Day lunches were a huge success across all the locations and have served more than 1200 people on a single day across the US. Speaking about the expansion plans, Mr. Koushik Koganti, CEO Godavari said, “We are proud to be carrying the legacy of Indian food, especially south Indian, to different and diverse corners of this vast nation that we made our home. They also added that Godavari chain is actively promoting the Hashtags of #GoogleofIndianFood and #IncredibleIndianFood. We TRUST our Legacy Continues in EDISON starting from 20th of February with a Special Grand Lunch Buffet! !